There are moments in life – simply unforgettable! BGL President, August Forster (right) and ZinCo Managing Director, Dieter Schenk, with the Innovation Medal for natureline at the GaLaBau. Instant greenery with the "Heather with Lavender" vegetation mat. At this year’s GaLaBau Trade Fair, ZinCo once again opened up new vistas for the green sector, winning kudos in a number of ways with its innovations. 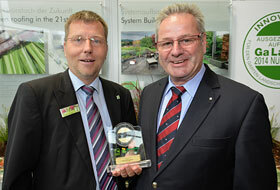 The new ZinCo system ”natureline“, the very first green roof system worldwide made from renewable resources, was awarded the GaLaBau Innovation Medal for 2014. This environmental option for the future of green roofing is notable for its proven sustainability and reliability. The jury, consisting of representatives from the German Federal Association of Horticulture, Landscape and Sports Facility construction (BGL e.V), Universities of Applied Science, professional associations, landscape architectural practices and companies in the horticulture, landscape and sports facility sector, was convinced. ZinCo presented the plant community “Heather with Lavender” “by the metre“ as an exclusive at the GaLaBau Show. This pre-cultivated plant mat is installed similar to the ZinCo sedum carpet, allowing for immediate full coverage even for “simple intensive green roofs”. The response from the trade was positive across the board. It remains to be seen how the mats will be accepted by the general public. 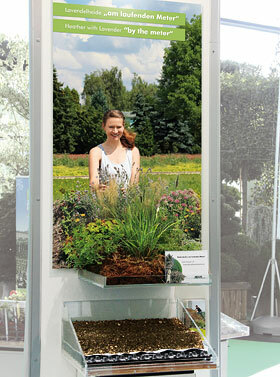 Visitors to the trade fair were particularly interested in the “Summer Plains with Aquatec“ system. This system is impressive due to its lightweight design and highly-efficient capillary irrigation. 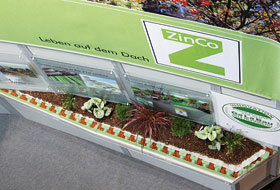 Detailed information on all new and known green roof solutions is of course available directly from ZinCo after the trade fair.